MailEnable Professional Edition includes all features of MailEnable Standard Edition plus additional functionality such as web mail and web administration, anti-virus support, enhanced anti-spam features and IMAP4. Professional Edition provides the features and flexibility to make it the ideal mail hosting solution for small to medium sized organizations. 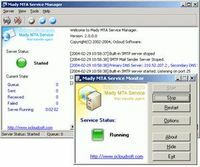 Features include: Powerful Administration - Easy to administer via the Microsoft Management Console, MailEnable has Web Administration to allow easier management of users and settings. 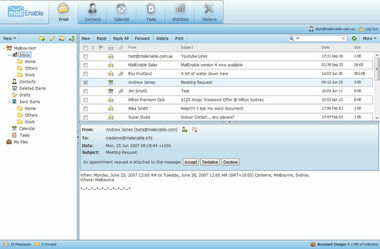 Professional Edition incorporates .Net web administration; Improved Spam Protection Professional Edition contains numerous anti-spam features, with the addition of SPF and Bayesian filtering to protect your system from unwanted junk mail; Full Featured Web Mail - Additional features, HTML support, personal contacts, folders, custom ‘skins’, pop retrieval and multi-lingual support. Now supports the .Net framework; Enhanced Security - Extensive security measures and authentication methods including, APOP and SMTP authentication, protect your mail server from unauthorized access. Now includes and NTLM support for high-level password encryption; Message Filtering - Message filtering allows you to define rules and actions for messages as they pass through MailEnable. Create message filters globally to quarantine messages, move, copy, or delete messages based on several criteria such as content, sender, recipient, subject, or attachment type. The addition of scripted filtering allows for the creation of a powerful filtering engine within MailEnable.